Talking point lessons may just become a reccurring series! I love when I stumble upon a topic that is both interesting and engaging, but doesn’t require a lot of time and effort. These types of lessons are great for sub plans, unexpected assemblies, early dismissals or weather delays that can wreak havoc on keeping classes on the same timeline. Many districts are requiring teachers to present their students with e-lessons on snow days. What better way to do this than with a talking points lesson that you can cater and adapt to your needs! This lesson and activity revolve around “mindful eating” because most of us often do the opposite! So, learn more about how you and your students can become more mindful of your eating! On a side note, if you have a topic that might lend itself well to a talking points lesson and/or activity, please let me know in the comment section below and I’ll see what I can do! Let’s be GREAT together! Most are familiar with the terms mindful and mindless. For good measure, have students look them up to learn what the actual definitions are. See the Bell Ringer Questions below. Share definitions and ask how these two terms relate to food and eating and what the characteristics of each are (t-charts are great for this). 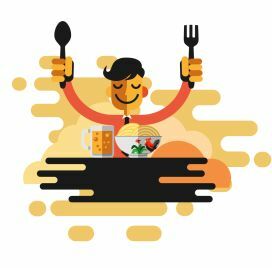 If students need a more in depth description of how these terms relate to eating, you can refer them to this article titled “Mindless vs Mindful Eating: What You Need to Know“. Next, show students a picture of Cookie Monster and ask if Cookie Monster is a mindful or mindless eater and what makes them think so. Finally, ask students which type they think they are and what makes them think so? You could also have them take this optional Mindful Eating Questionnaire to find out. Have students learn more about mindful eating as they watch two YouTube videos and complete some questions. The questions can be completed online as a Google Doc or can be printed out as a hard copy. The two videos used are Mindless Eating and BASICS of Mindful Eating. Using the information from the videos and other reliable web sources, if necessary, have students create an informative “Tips & Doodles: 10 Ways to Practice Mindful Eating” Placemat. Students will use the provided graphic organizer and markers to add their tips and creative doodles. A “turtle” example has been added so students get the idea of what they are to do! Explanations can be written in more detail on the back of the placement if desired and then shared as a class.